If grilling, preheat grill to medium-high heat. If baking, preheat oven to 450° F.
Season green beans with salt and pepper. Cut pastrami into strips about 1 – 2 inches wide. Evenly distribute green beans and butter among pastrami slices. 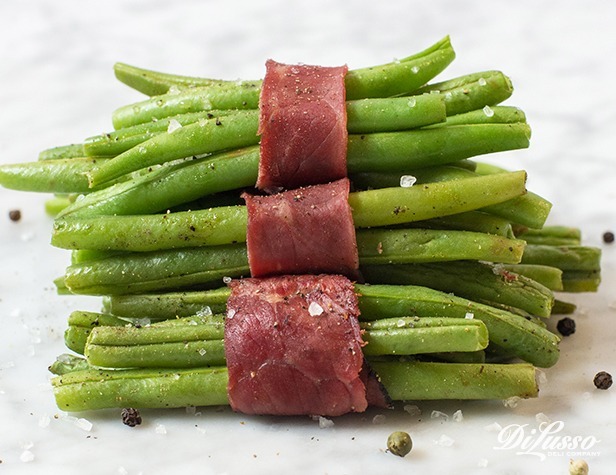 Wrap pastrami around green beans to create bundles. Loosely wrap all bundles in 1 – 2 large pieces of aluminum foil. Grill for 15 – 20 minutes or bake for 25 – 30 minutes, until green beans feel tender.